Artist Michelle McKinney creates ethereal nature-inspired art using an unexpected medium: industrial metals. 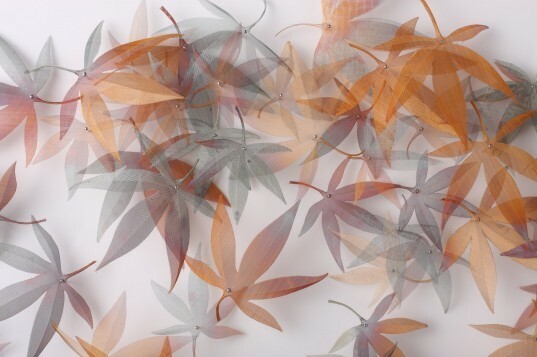 McKinney hand cuts ultra-fine woven metal into large-scale artworks that recreate forms and symbols found in nature. From butterfly wings to autumn leaves, each delicate piece is crafted with such finesse that it's nearly impossible to detect the provenance of her industrial materials. 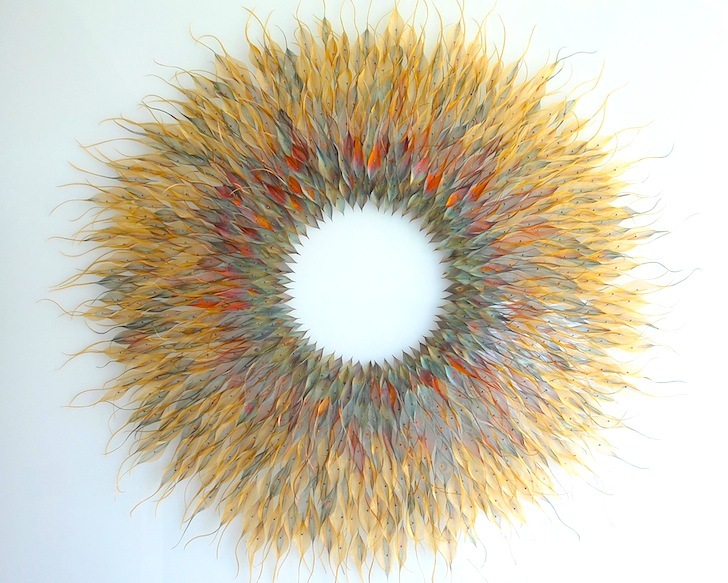 U.K.-based Michelle McKinney started her career in jewelry design, but shifted to larger-scale contemporary artwork and sculptures after she discovered ultra-fine woven metal. These extremely malleable metals have a translucent quality and can be easily bent by hand and cut with scissors. Inspired by the ephemerality of nature, McKinney captures and contrasts that fragility with the strength and durability of the woven metals. McKinney crafts, colors, and shapes each individual component by hand before putting them together to form a larger shape that indicates movement. The simplicity of her artwork belies the complexity and effort of capturing the feeling of fleeting nature with lifelike metal parts. The shapes are cut from copper, brass, or steel mesh and then pinned into a dynamic shape on a white background. U.K.-based Michelle McKinney started her career in jewelry design, but shifted to larger-scale contemporary artwork and sculptures after she discovered ultra-fine woven metal. Michelle McKinney makes butterflies out of stainless steel. McKinney colors her metals after cutting and shaping them. These extremely malleable metals have a translucent quality and can be easily bent by hand and cut with scissors. Inspired by the ephemerality of nature, McKinney captures and contrasts that fragility with the strength and timeless manmade metals. McKinney crafts, colors, and shapes each individual component by hand before putting them together to form a larger shape that indicates movement. The simplicity of her artwork belies the complexity and effort of capturing the feeling of fleeting nature with lifelike metal parts. The shapes are cut from copper, brash, or steel mesh and then pinned into a dynamic shape on a white background.